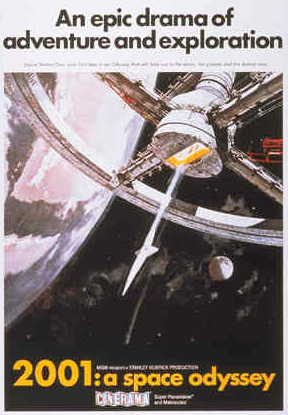 Hollywood Lost and Found - "2001"
To ensure maximum scientific credibility and to avoid contradicting what is known about space technology, Kubrick obtained the assistance of Arthur C. Clarke, one of the most knowledgeable writers in the field. Together they developed a screenplay that satisfied two conditions 1) it suited Kubrick's basic story concept ("ape, man, superman" or, as Kubrick prefers "ape, man, angel"); and 2) it was compatible with current scientific knowledge. Then, having a story line with a carefully worked out explanation, Kubrick brilliantly removed all narration explaining what was going on. While Clarke logically points out that any sufficiently advanced civilization will seem supernatural, Kubrick's removal of all explanations, and his music selection, give the distinct emotional impression that the extraterrestrial intelligences in 2001 are supernatural. By first creating a carefully thought out story-line, then removing all verbal explanations, and finally adding music with transcendental implications, Kubrick creates a magnificent natural/supernatural ambiguity that is the very heart of the film's artistic greatness. Quite aside from admiring Kubrick's artistic achievement in 2001, acceptance of what seems to be the main thought behind the film is quite another matter. Kubrick seems to be saying that we humans needed outside help to get where we are now and that we'll need more help to make the next major jump. The episode with the killer computer is intended to make the point that we cannot exceed ourselves with mere technology. HAL is a false superhuman. (From the Filmex "50 Hour Science Fiction Movie Marathon" program notes, March 1975.